First off the layering. I took a free on-line class on layering and have been playing around a bit with my photo-shop. I've never done anything with photo-shop other than touching up here and there. I picked this photo of the cardinal that I've posted before only because the layering color I thought would go well with it. I think I'm hooked. Here's the before. Pretty cool eh? Now, for the award. My new found blogging friend Texwisgirl, awarded me with the Stylish Blogger Award. I found out some things about her and now I have to post 7 things about me. I know some of you may have read these before, but I have some new blog readers who might not have. 1. I'm married to my High School sweetheart and we have 11 children...5 girls and 6 boys, eight are married and we just had our 21st grandchild. 2. We recently moved here to Southwest Wisconsin from Northeast Illinois last August. I love living in the country. 3. I love Aprons. Especially vintage ones. I sew, knit, crochet, and I've just taken up quilting. 4. I've always been a stay-at-home mom. I started working outside the home before our youngest was born and I have worked off and on since then. 5. I love taking pictures, and I take pictures sometimes of the oddest things....but, they make great shots. 6. I'm going to be 50 years old this October. I loved my 40's and I know my 50's are going to just as amazing. If not better. I was featured on "one pretty thing" for the fat quarter pumpkin that I made. 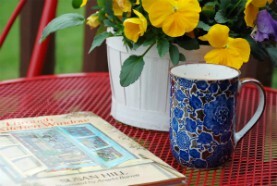 Check out Rachel's blog to see more wonderful things she features. I also was honored with the One Lovely Blog Award from Vickie over at Victoria's Voice. I need to pick 15 blogs but that is so hard to do. So instead I pick all the blogs I read because they are all lovely blogs. Good morning everyone. Today is Saturday, what's on the agenda for you today? I plan to start making some curtains for my bedroom. The ones I have now just have to go. 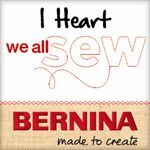 I can't wait to start cutting and sewing. Renee over at Sewn With Grace honored me with the Sunshine Award. Thank you Renee! Now, I know I'm supposed to pass this on but I can never pick, so to all the blogs I read this is for you. Plus I'm going to do something different. I give this Sunshine Award to all who read my blog. Whether you comment or not you all bring sunshine to my life. Thank You! I took the frozen neck bones and thawed them out. I browned them in a cast iron dutch oven. Don't you just love green onions? I do, and was too pumped when this recipe called for them. After adding the onions and seasonings, you simmer it. So, I simmered it and simmered it. I know you're not supposed to take the meat off the bone but I did to stretch it out. I also thickened the juices and added rice to it. I have to say I wasn't overly fond of this dish. Maybe next time I won't add the rice but just have it as a side dish or maybe serve the neck bones over the rice. Or better yet I'll just find another way to prepare neck bones. Jim's been having a hard time getting used to his new grain mill. His other two mills ground the flour so differently. They almost heated the flour up so the rising process was very short. This mill grinds the wheat in a much different way. So right now it's trial and error with each batch. and also developed a funny looking top. But I have to say, despite how the tops looked this had to have been the best bread so far. I titled this post "random chit~chat" because that's what this ended up being. Just random stuff all put down. I want to share with you a wonderful food blog called Full Bellies, Happy Kids. Sandra has some wonderful recipes, head on over and check it out. My friend Kar gave me an award oh so long ago, and awful me totally forgot about it. I have to post about 7 things that I love. I'm going to post the first things that come to my mind, because I love a lot of things. 1. Hubby and that includes all my family. 2. The smell of a baby. I bet you never would have guessed my answers. The rules to this meme award are. 1. List 7 things I love. 2. Link back to the person who gave the award to you. 3. Pass it on to 7 other bloggers. I can't decide who to pass this on to. I love too many blogs, so if you read my blog and have a blog I pass this award on to you. And speaking of fabric that I love so much. Here is some I bought last weekend for a table runner that I want to make. Now to find the time to make it. I bought a tulip plant the other day and it's starting to open up. Just a bit of Spring to have around the house. I was given a couple of Awards and I want to share them with you. Kar over at Kar's Down Home Bliss gave me this award. Thank you Kar. Joyce over at Home Again-Vintage Treasures gave me this award. Thank you Joyce. I have to post 6 things I'm thankful for. 4. My freedom, and that I'm able to write this post. I know I only have 4 things that I'm thankful for...anything else I thought of sounded corny and these 4 were the ones that popped into my mind right away so I went with these. Now, I'm supposed to pass these 2 awards along but I always have such a hard time deciding who to give them to...so I'm giving them to all who are on my blog list, because you are all deserving of both of these awards. Now for the help. Last night at my ASG meeting we were all given a wrapped gift. Inside each gift there were 2 pieces of fabric one measuring 1/2 yard and the other measuring just over 1/4 yard. This is our challenge fabric for the year. Now, I have done it every time since joining but there are many who don't. This year no one was given the chance to say NO. I think that's great...no more party poopers. Now here is the fabric were were given. Any ideas for what to make would be great. I do have a few...a bag/purse, a pillow, cover a small foot stool, line a basket. We have to use at least 75% of each fabric piece. I would love more ideas if anyone has any. I'm making a 3 Button Wrap out of this delicious, yummy yarn. So far, I am about 25% done on it. You all have an awesome day and I'll see you on Monday. Zaroga over at Zaroga's Nook gave me this award. "This blog invests and believes the PROXIMITY - nearness in space, time and relationships! These blogs are exceedingly charming. These kind bloggers aim to find and be friends. They are not interested in prizes or self-aggrandizement. Our hope is that when the ribbons of these prizes are cut, even more friendships are propagated. Please give more attention to these writers! Deliver this award to eight bloggers who must choose eight more and include this cleverly-written text into the body of their award. Now I have to give this award to 8 bloggers and awards are given in no particular order. Maddy over at Maddy's Glass House e-mailed me that she is giving me her very own award that she made. I think that this is really a neat award. So here goes...Let's Give Thanks. As you all well know I have a LARGE family. I am blessed in so many ways. From being called Grandma, to Mom, to Judy, to Boss. (lol) Boss is Jims new name for me. I wonder why? HeHe! My life wouldn't be complete without them all. I am thankful for my faith. My faith has helped me through so much in my life, that without it I really don't know where I would be. I am thankful too for my health and that I'm able to get up in the morning to a new day. Some days are great and some days might not be very good but I have my family, my faith and my health to make it through whatever kind of day it is. I received this award yesterday from Nonizamboni over at Peacock Blue. I am really tickled to receive this. I have "met" Nonizamboni just recently (tho Nonizamboni is not her real name) and found out that she is a BLACK HAWKS Fan. How cool is that? She has a wonderful way of writing and I enjoy going there to see what she has to say. I am going to give this award to these lovely women who I visit most everyday. They are my "fix" for the day. Niki over at Rural Writing. I love visiting Niki. I get inspired by her in so many ways. 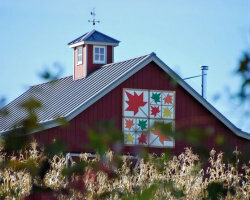 She blogs about her life on Derry Meadow Farm. Angie over at This is My "Real" Blog. Angie once lived in my area and now lives in Tennessee my "favorite" State. She has a beautiful family and I also enjoy her writings. Angie is so full of life and happiness. Maddy over at Maddy's Glass House. Maddy lives a full life trying to raise a child with Autism. She has a wonderful way with words that when I stumbled upon her blog way back when and I keep going back for a visit. I enjoy so many blogs that it was hard to pick because they all are excellent in my book and deserve this award. Betty from Country Charm gave me this award. I would also like to pass this along to all my blogging buddies. It is too hard to pick a few because I enjoy them all. 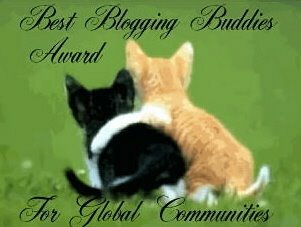 So, if you consider me your blogging buddy, I pass this "Best Blogging Buddies Award" on to you. This may be a long post so bear with me on this one. Now I am not sure how I feel about all the awards that you see on all the blogs out there. This Blessing award was given out to all who read Mary's blog. Mary is really a pretty amazing lady and I visit her blog from time to time. Mary is the one who made my banner, and my Etsy banner. I have her button down on the bottom left of my sidebar, if you want a new banner. Any way, Mary made my banner when she was sick with a ruptured ear drum and ended up getting a bad reaction to the meds she was given. She made my banner when she was at her sickest time. Though at the time I didn't realize how sick she was, but she made it within a few days. Thank you Mary. I thought that since I only visit once in a while to her blog that I wouldn't take this award, but the more I thought about it, I decided to. The idea…it’s a game of tag with a difference, rather than looking inwardly, we look outside ourselves and bless, praise and pray for 3 blog friends. By participating in this endeavor we not only make the recipient of the blessing feel valued and appreciated, but we are having some fun too. We’re going to see how far the bloggin’ blessings can travel around the world and how many people can be blessed! 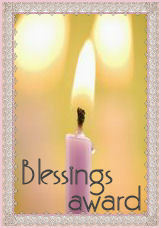 Recipients of a bloggin’ blessing may upload the above image to their sidebar if they choose to. If you receive a bloggin’ blessin’ please leave a comment on this thread here so that we can rejoice in just how many blessings have been sent around the world. *Elizabeth Q. is the first one I am going to give this award to. I met Elizabeth when I joined her Christmas Stocking Swap way back in November. Elizabeth is going through a bit of a hard time right now, so I am giving this Blessings Award to her. Elizabeth is a very giving person. The other day I went to my mail box and in the mail was a package from Elizabeth. She had sent me two patterns, just because when she saw them she thought of me. I was very touched. *Angie is the second one that I am going to give this award to. I met Angie when she commented on my blog. Angie and her husband lived at one time not far from where I live now. Angie has a beautiful family and right now Angie is in need of some prayers, as she is going through a surgical biopsy today to take out an area of concern from her bre*st. Her mother had bre*st cancer, so being that there is family history is cause for concern. Through all the waiting and seeing, Angie has really kept up her spirits and her faith in God to carry her through this trial. The last award I really thought about. Who will I give the last one to? So I thought hard and long about the last one. *Sue is the last one I am giving this award to. Sue is another one I have really met through blogging. Though I didn't know Sue, I did know 2 of her sisters, so I knew of her. Sue is a very witty person, who every time I go to her blog, I get either a chuckle or a good laugh for my morning fix. A lot goes on at Sues house, from kids breaking bones, to running over deer, to having shoulder surgery on her own shoulder, and trying to carry a baby, do laundry, make meals or just plain run a house with only one arm. So ladies, this Award is yours if you want it. I feel blessed to call you three "friends".